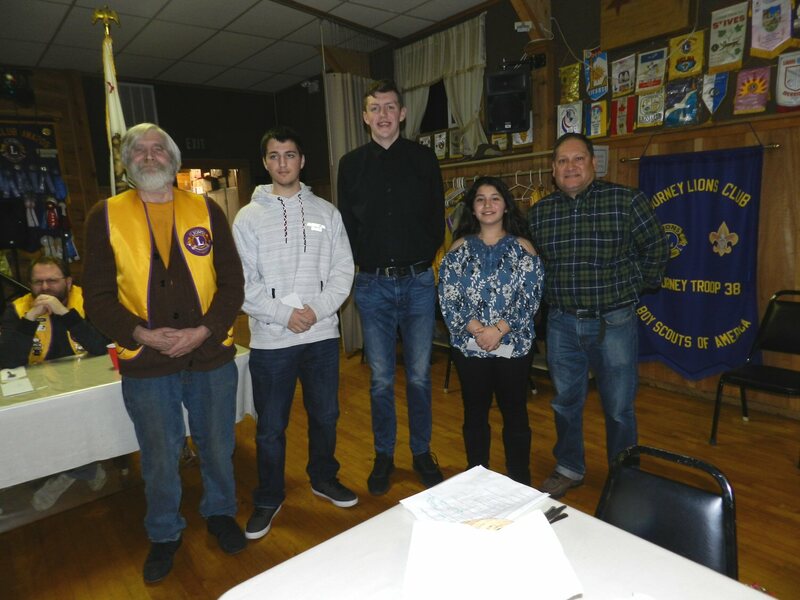 The Burney Lions Club honored three students on Thursday evening March 15. Chris Phipps was named 12th grade Student of the Month for February. Austin Kaczorowski was named 12th grade Student of the Month for March, and Vanessa Mungia was named 8th grade Student of the Month for March. After being introduced by Burney High School Principal Ray Guerrero, each student was presented with a check by Lion George Whitfield. Phipps and Kaczorowski each received $100 and Mungia received $50. Chris Phipps has a 4.0 grade point average. He is active in Interact, Leadership Club, Mentoring, basketball, baseball, California Scholarship Federation (CSF), and Leos. He enjoys playing sports, playing video games, and spending time with family and friends. This year Chris made All-League in basketball. Chris would like to travel abroad. After graduation he plans to attend community college and play basketball. He is good at working with children and writing. Austin Kaczorowski has a grade point of 3.5. He is involved in 4-H, football, wrestling, and track. In his spare time he likes to read. He would like to go skydiving. In the future, he plans to pursue a career in law enforcement. Austin’s parents Darrin and Michele Kaczorowski and his sister Erica attended. His dad said that they are very proud of Austin. Vanessa Mungia has a 3.29 grade point average. She is a member of California Junior Scholarship Federation. She participates in basketball, softball, and volleyball. She is good at math. She likes going on long hikes and swimming, She also enjoys drawing and watching shows on Netflix. In the future she would like to go to Humbolt Stare University and live in Arcata. Her grandparents Jerrilyn and Randy Quinn, her aunt Tyelo Wilson, her brother Cisco Chacon and sister Ta-sti Chacon, as well as her cousin Madison Villarruel all also came to watch her receive her award.